Spring gardening catalogs started showing up in my mailbox this week. In fact, I believe the first arrived on Christmas Eve. 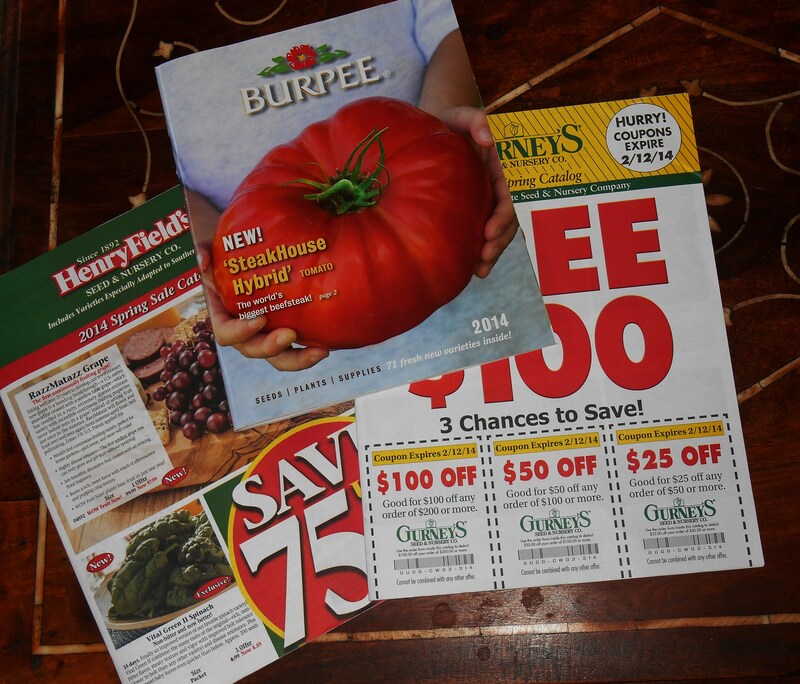 The new Burpee catalog features a huge; I mean pumpkin sized, beefsteak tomato lovingly cradled in the gardener’s hands. Our Lantana bed remains full of hungry birds much of the day. It is Saturday, and I’m itching to work on my garden, even if the temperature is still hovering in the low 40s out there. Actually, my partner just changed to mucking shoes and headed out the door. Here we sit firmly between Christmas and the New Year. The tree is still up, but I’m definitely feeling the fresh breeze of welcoming in a new year, and a new gardening season. 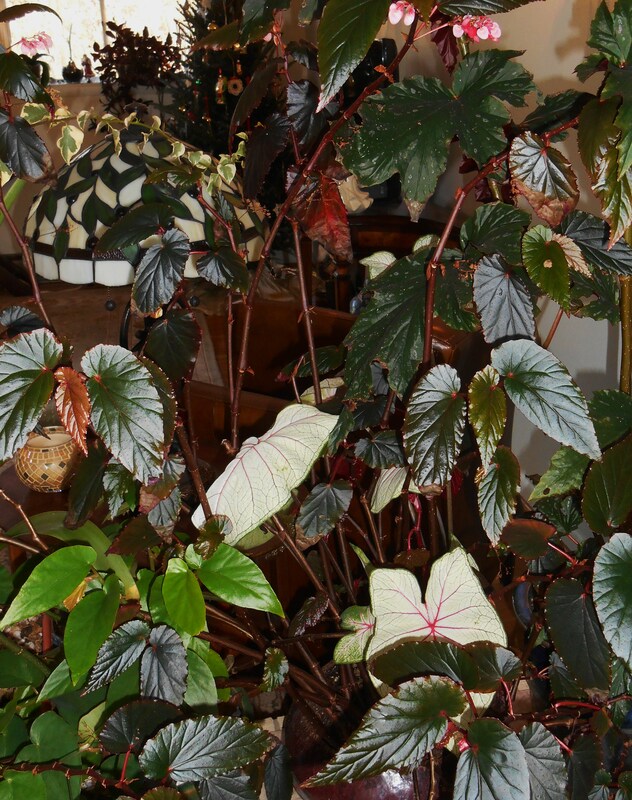 The cane Begonias, and even some Caladiums, are quite happy with their spot inside. Even as I gather the last of the wrappings and packaging for the recycling bin my eye is on that little stack of catalogs. My mind is turning to what will soon fill the pots emptied by our frosts and freezes. This morning we took time to water all of the plants living inside and gather up the fallen leaves. We’re happy to see the Bouganvillea, which first dropped its rose pink flowers, and then dropped most of its leaves on the living room floor, breaking out with a new crop of leaves to carry it into the spring. As they grow out its sharp spines look extra dangerous, and it commands tremendous respect. 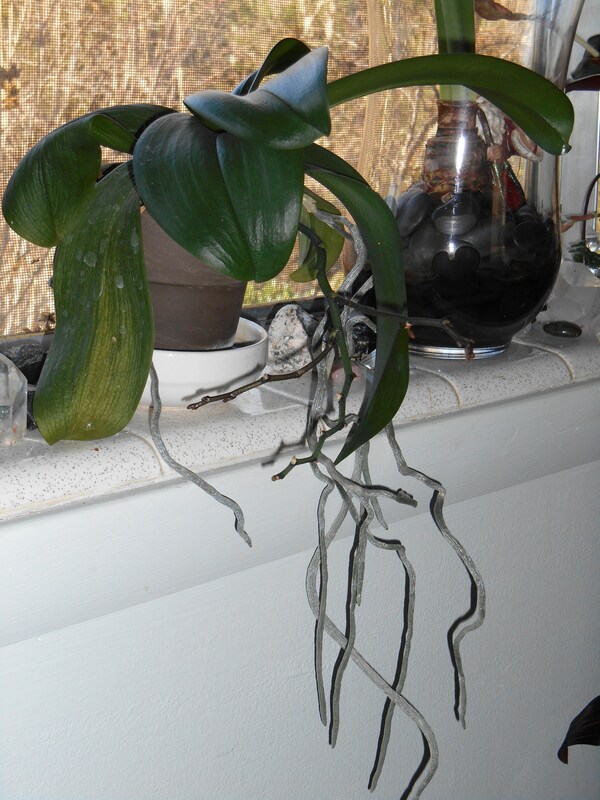 There are at least three orchids throwing out flower buds. The Jewel Orchid, with its burgundy, silver, and striped leaves will soon cover itself in long spikes covered in creamy white flowers. Several of moth orchids have buds swelling and will give us many weeks of their delicate lavender and pink flowers in late winter. Many of our cane Begonias are in full bloom. We are fortunate to get light from many directions, and so keep the plants happy most of the time. Caladiums are in leaf, ferns throwing out new fronds, and the Philodendrons all have new leaves emerging. So far so good on keeping everyone alive through the winter! But, winter it is. And will be, here, for many weeks to come. Our local garden centers are enjoying a long break now, and have only the barest bit of leftover stock. We can look forward to freezing nights for at least another 15 weeks. 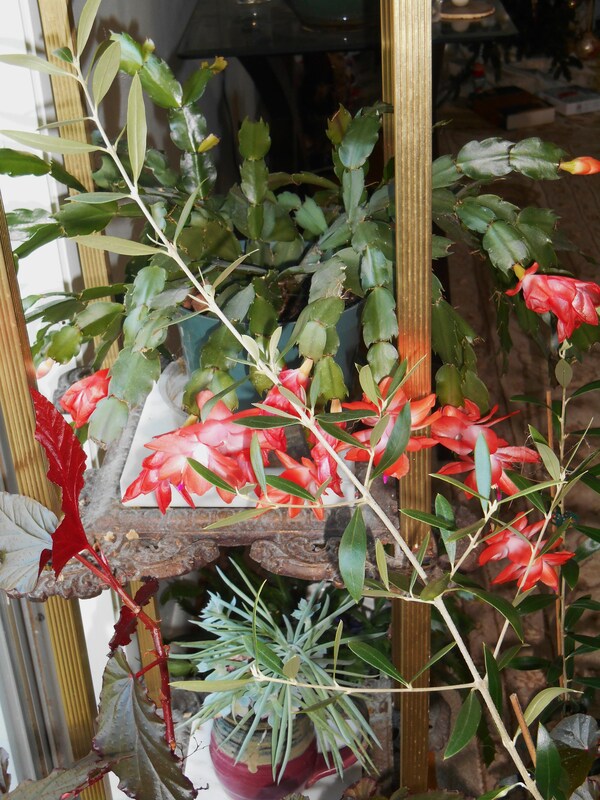 Our very happy Christmas cactus, and an olive tree surviving its first winter. So, what is a gardener to do while waiting for spring? Here is a bit of a beginning of a list. It isn’t all inclusive. My mind is still in recovery from the holidays. But here are a few reminders to carry us through January, at the least. 1. Keep the houseplants groomed and watered. Wipe off leaves when they get dusty and remove those old ragged looking leaves. New ones will soon follow to replace them. Deadhead faithfully after flowering to encourage new blooms. Give those which will bloom all winter a drink of dilute fertilizer every other week, and turn the pots from time to time to encourage even growth. This poor geranium won’t come back after our hard freezes. It is time to cut it back, along with all other frost damaged foliage. 2. 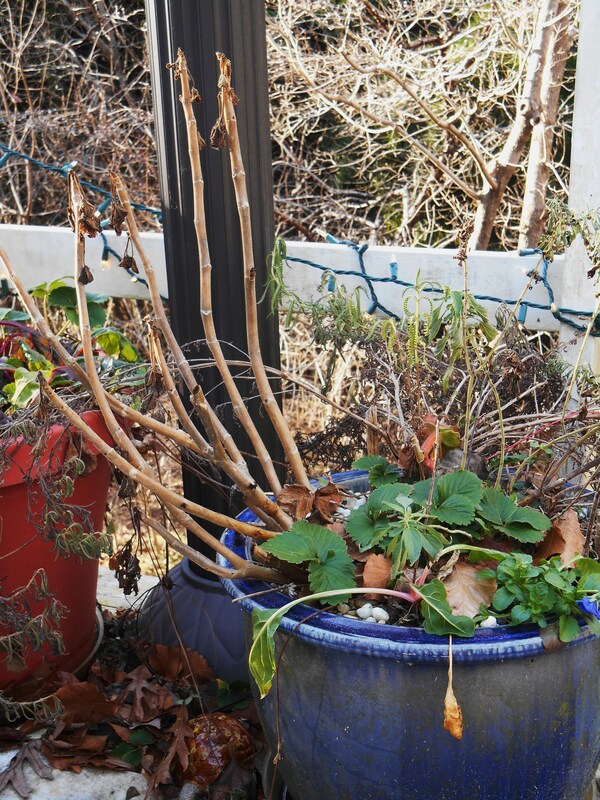 Cut back and remove the remains of any frozen herbs and annuals. It’s time now to tidy up. Perennials destroyed by frost can be left a few more weeks to give food and shelter to the garden birds and to protect the plants’ roots. 3. Take a good look around and plan changes to the garden. Now that you can really see the bones, plan any new spring projects. Will there be new raised beds? Any changes in the lines of existing beds? Will there be new pathways, arbors, walls, ponds, or patios to build? January is a good time to take photos, make sketches, read gardening books, read articles online, and plan out purchases for the necessary materials. 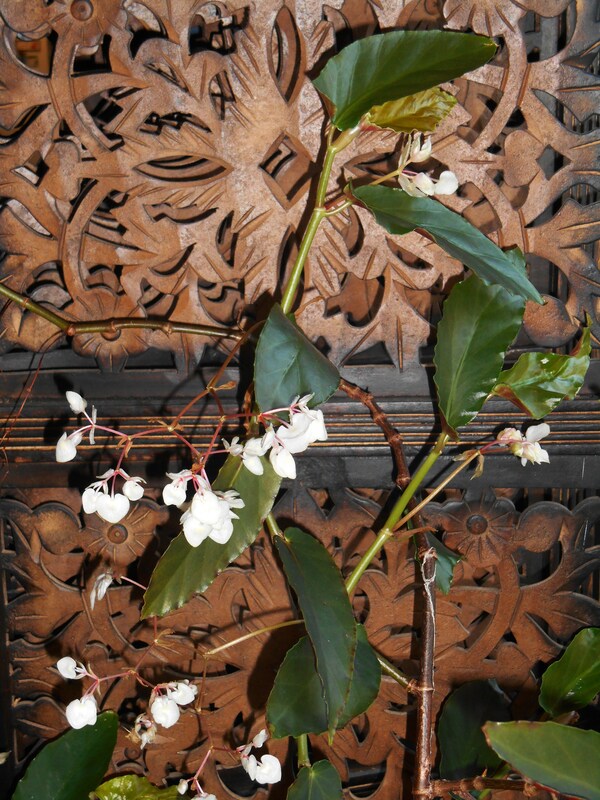 This cane Begonia lives happily inside, just a few feet from where it summered on the deck. 4. At the same time, plan what you want to grow in the year ahead. Will you focus on vegetables, fruit, flowers, herbs, or shrubs? Do you want to add any trees to the garden? 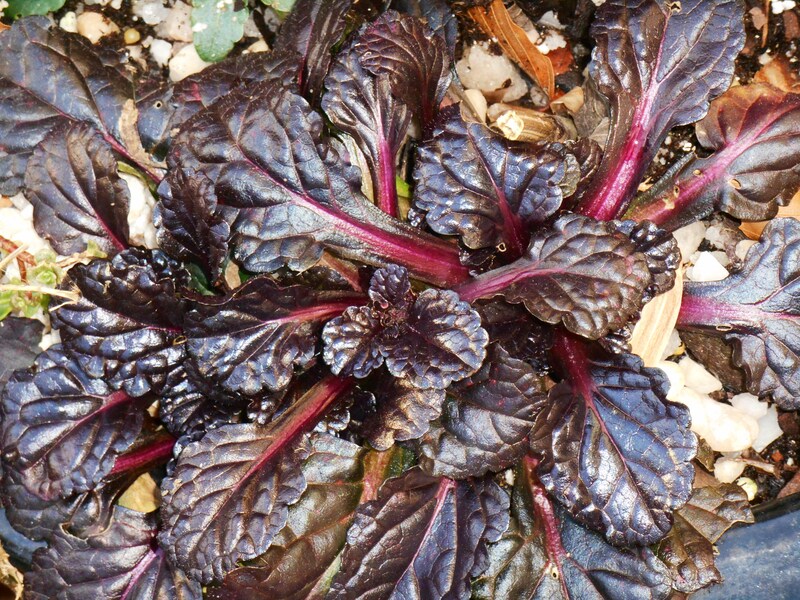 Will you repeat your 2013 garden, or try some new crops? Are you growing enough of your own food? Do you want to attract more wild life? Do you need more areas of shrubs and perennials which look after themselves? Now we get to enjoy the catalogs. There is a lot to learn about new introductions, cultivars of old favorites, and cultural requirements of unusual plants in the nursery catalogs. I always learn useful things by reading them carefully. I’m also inspired to try new combinations of plants, and perhaps shift to new colors in the new season. 5. Develop shopping lists for new purchases. This is where self-discipline is required. I have spent dozens of winters reading gardening catalogs, making lists of what I want to grow. This can be a very expensive hobby, and I’ve learned to let those lists sit for days, if not weeks, before ever making an order. I waited months between wanting an Edgeworthia and finally planting this one. After several trees fell in summer storms, we finally had the right spot to plant it. Truth is, there just isn’t the right spot for a lot of the plants on my “want” list. Especially after working with a garden for a few years, there isn’t room for many new plants. One also learns what not to plant in a particular garden because the conditions aren’t suitable. So the wish list made in January needs serious editing before purchases are made closer to spring. Another reason to love January, when everything seems possible. 6. Build and improve the soil. Although Camellias grow well in our garden, it is a constant struggle to protect new plantings from the deer. 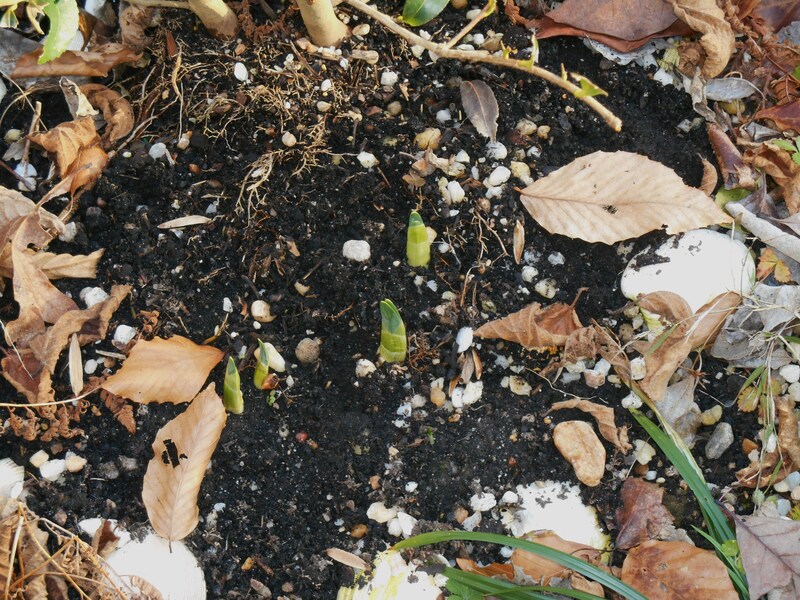 Daffodils have begun to peak out of the soil at the base of this little shrub, and it is ready for a topdressing of fresh compost. If you’ve been gardening more than a season you know good soil makes the difference in the vitality of your plants. Plant in poor or compacted soil and your plant will struggle and eventually die. Plant in a well prepared bed, and the same plant will grow huge and productive. Good gardeners feed their soil. Spread all of those coffee grounds and tea leaves on your garden beds. Dilute left over brewed coffee or tea and use it to water, or pour over frozen beds. 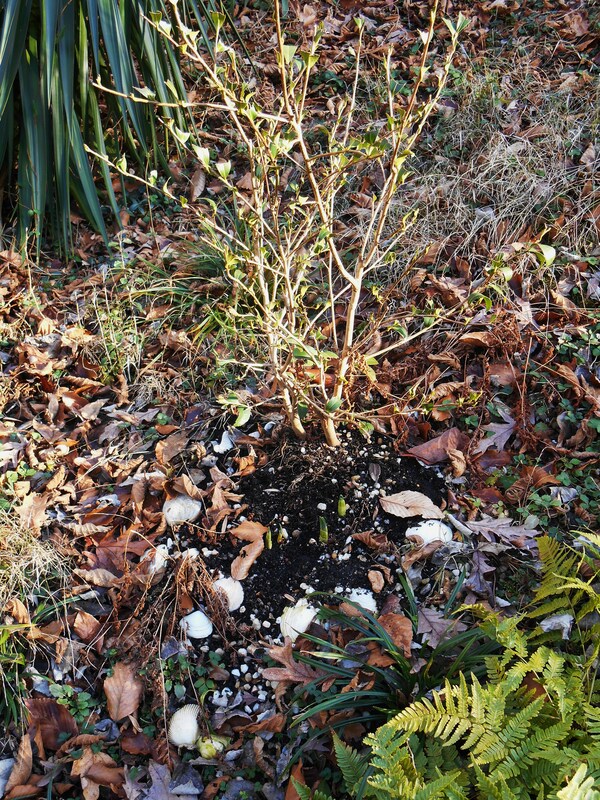 Rinse and crush egg shells to use as mulch where slugs are a problem, or where more calcium is needed. 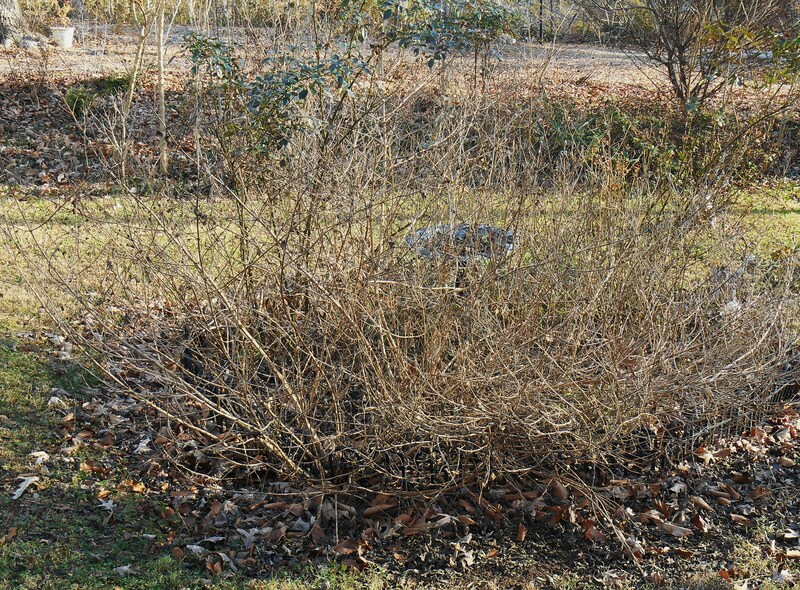 Continue to chop up fallen leaves and spread them under shrubs or on perennial beds. Save cardboard and newspaper to spread on the ground where you plan to create new beds this spring. Not only will they kill the grass underneath, but they will attract earthworms, and enrich the soil as they decompose. This crepe myrtle, which sent out lots of new growth after getting flattened by our fallen oaks, needs pruning now. We will remove most of these new branches, sending the plant’s energy into a few strong leaders which will form the new structure of the tree. 7. Prune hardwood shrubs and trees. Now that you can see the plant’s structure, remove extra branches. Limb the plant up to reveal its trunk. Head back laterals to encourage branching, especially on fruit bearing trees. 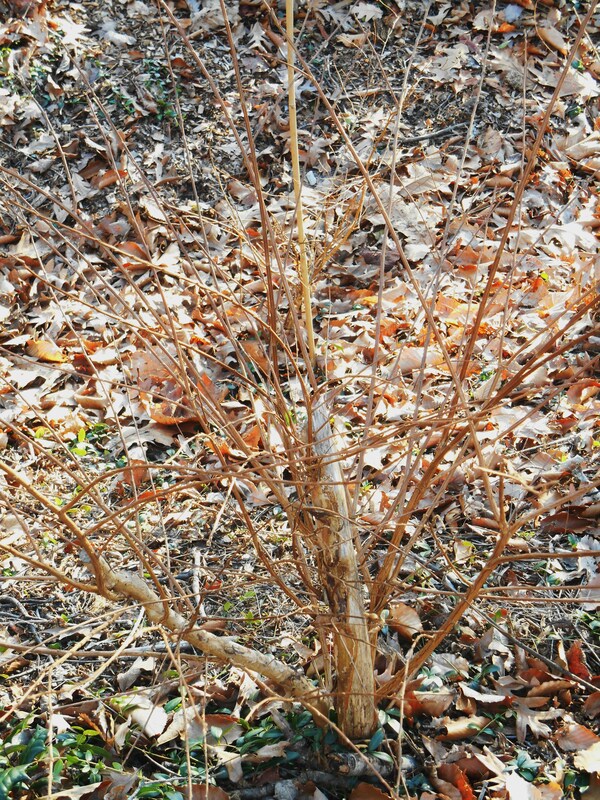 Remove any crossed limbs, and prune deciduous shrubs to control their size. I’ll be working on my Rose of Sharon and Crepe Myrtle shrubs soon. It is still a little early to work the roses, as they will try to send out new growth during warm spells; but I’ll tackle them by early February. A final word of caution: If you are a gardening addict, as am I; the growing pile of glossy garden catalogs is heady temptation. The photos are just exquisite, the plants so healthy and alluring. I want to grow them all. 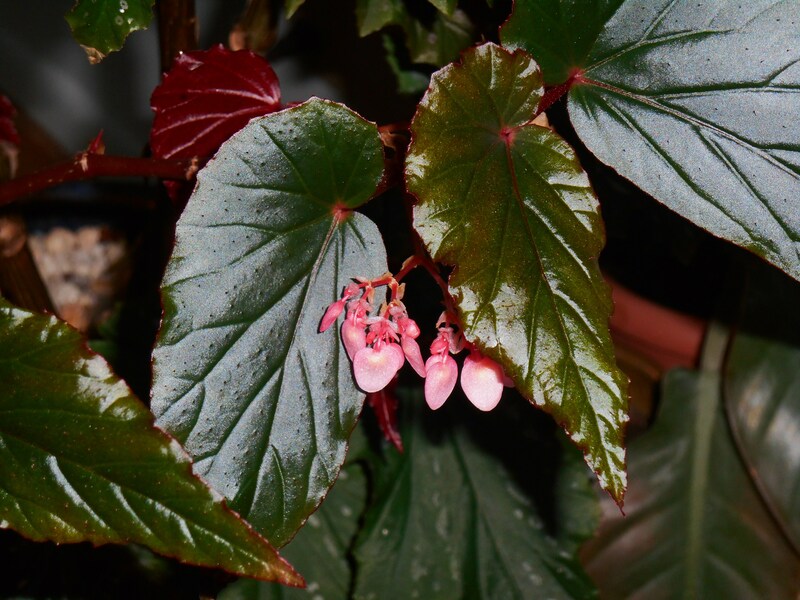 A favorite Begonia, which bloomed all summer, continues on into the winter indoors. 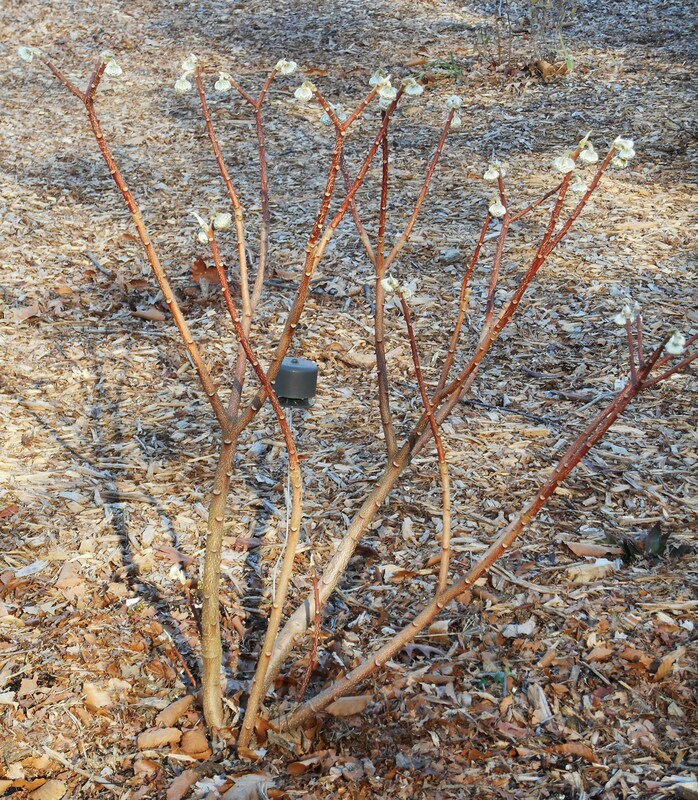 Fertilize to keep winter blooms coming. But, I’ve learned, that what comes in the mail once you’ve ordered bears little resemblance to the photo. Although some companies now send living starts, plugs as they’re called, many others still send “bare root” plants, bulbs, seeds, or tubers. If you are patient, and skilled, you can eventually grow this pitiful beginning into a lovely plant. Ajuga, commonly offered in winter plant catalogs, is always sold at garden centers in spring. By waiting, you’ll get a healthy clump of living plants ready to grow and bloom, at a similiar, or lower, price. Please notice the “if.” I’ve done it, you may have done it. But why go through the effort if you can buy a healthy, similarly priced plant at your local garden center later into the spring? In fact, I’ve found better, bigger plants of the same variety, at a lower price, at the correct time for planting; by waiting to shop my garden center. 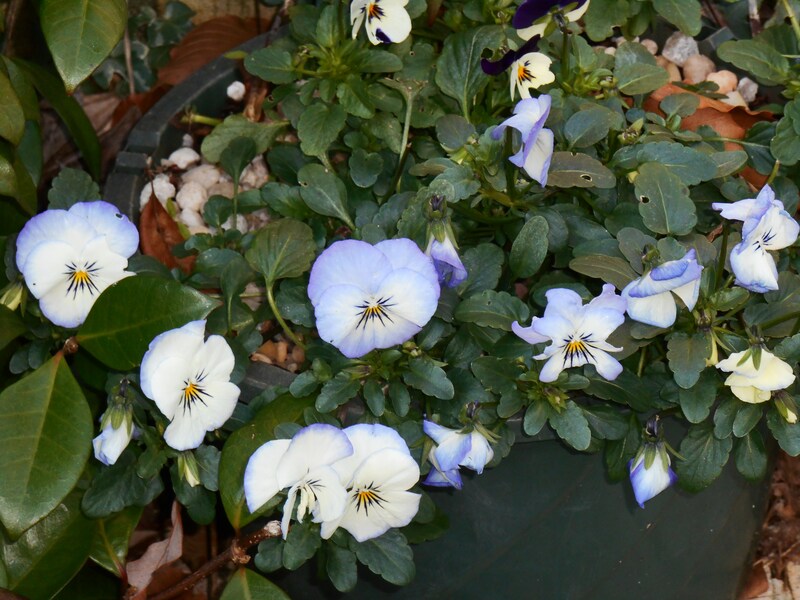 Violas are a specialty of the Homestead Garden Center here in Williamsburg. They grow thousands of plants each autumn. 8. Shop your local garden center. I’m not talking “big box store” here. The locally owned, family run garden centers aren’t getting much business between Christmas and Easter. It is a slim time for them, and your business means a lot. Even if you just stock up on some fertilizer, a few new tools, maybe some fresh pots or baskets; buy something. It is also a great time to shop for deals and establish a relationship. If you take the time to chat with the folks who run your local garden center you will learn a great deal. They are experts at gardening in your area. Then, later, when you want to ask whether or not they will carry that particular variety you’re shopping for, you will know who to ask. And chances are good that they know you, and will do their best to order it. 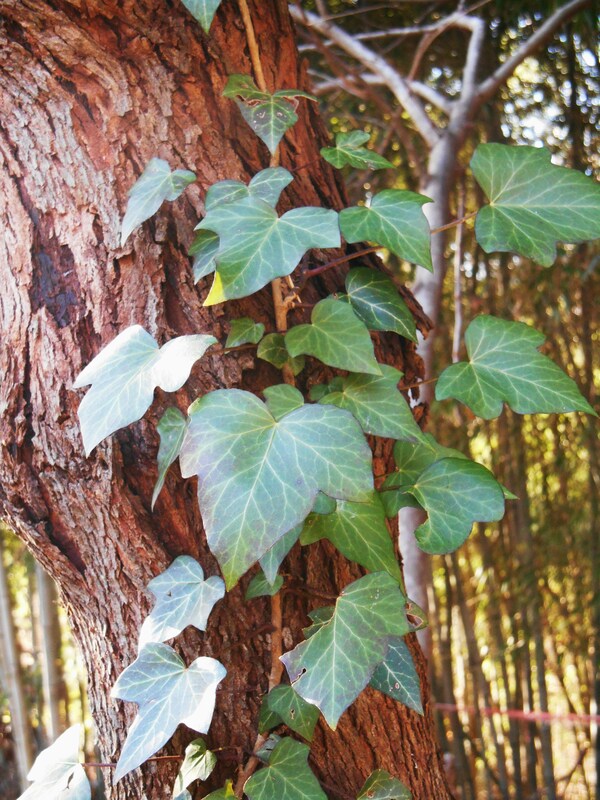 Ivy shines on winter days. Remember to walk around and enjoy the winter garden. So please pour another glass of Eggnog, if you enjoy it; or a more inspiring beverage if you don’t. Settle into that warm and cozy chair with a stack of gardening books and catalogs as the sun sets in late afternoon for a few more frozen weeks. 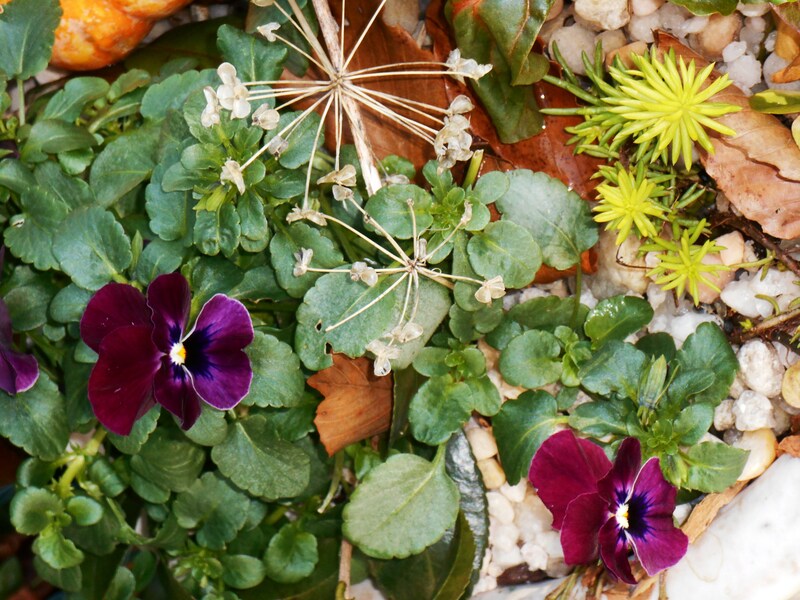 It’s time to dream that New Year’s garden into reality. I just moved to a new home that currently has a large lantana bed that looks similar to your picture. I am new to lantana. Any suggestions for caring for it at this time of the year? Congratulations on your new home! Not knowing where you live, I’ll tell you how I care for Lantana and let you adapt to your climate. Lantana are tender perennials. Some survive in Zone 7, but many are hardy to Zone 9. They will surprise you, though, but surviving winter when properly protected. I never trim mine back until the weather is warmed in spring, and frost is unlikely. They don’t look great, but I try to wait to trim until late March or early April here in Zone 7. When I cut them back, I also spread about an inch of compost around them, and give them a handful of Espoma ‘Rose Tone.’ Lantana are actually shrubs, with extensive roots. Although I cut them back hard, I’ve wondered about experimenting with trimming them only by about half. New growth emerges from the old wood fairly late in the spring, late April or early May for us. 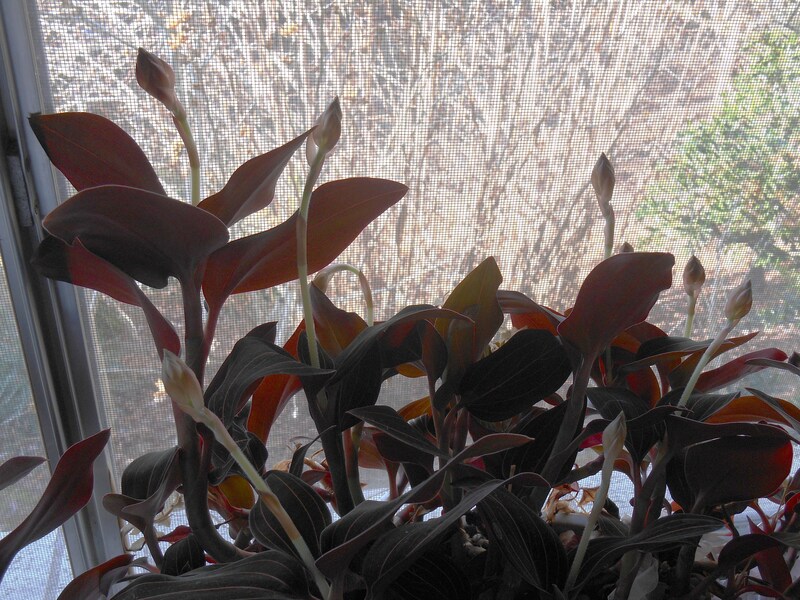 Flowers appear on new growth by early June. Lantana like full sun and heat. They bloom from early summer until frost. You can trim them back to make them bushier, but I generally just let them grow. In pots, I feed them. In the ground, I let compost and the spring feeding of Rose Tone feed them for the season. I hope that helps, Cadey. Here is more information: https://forestgardenblog.wordpress.com/2013/09/09/miss-huff-perennial-lantana/ Thank you for visiting Forest Garden! Wonderful post, WG. Thank you for all of the good advice and suggestions. I’m starting over, and often feel a bit overwhelmed, but I also filled thrilled with new possibilities. This is a different growing zone for me so I have much to learn.